A quest for vengeance wouldn't be complete without a little poison. Having tired of his retainer's futile attempts at reining in the unstoppable samurai, the shogun himself sends Abeno Kaii, a master of poison, to join the Yagyu in their hunt for ronin Itto Ogami and his little boy Daigoro. Armed with a sack full of poison and a network of streetwalking spies, Abeno creeps ever closer to the father and son. 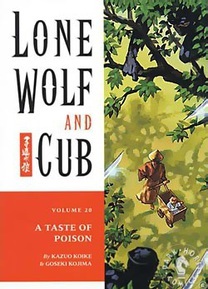 Soon Ogami and Daigoro find themselves surrounded on all sides, facing deadly secret agents, murderously seductive prostitutes, and a river of poison flowing all around them!